Kabocha squash are globe shaped and dark green, with celadon coloured stripes. They have a dry texture which is favoured for its sweet nutty flavour. Fully vine ripened and handpicked, succulent Kabocha has an intense yellow-orange flesh and a hard shiny skin. Kabocha or Hobak is it is known in Korea has an exceptional naturally sweet flavour. It is very versatile and can be roasted, steamed or baked and is a common ingredient in vegetable tempura and soups. Kabocha are rich in beta carotene, with iron, vitamin C and potassium. Bearsley Exports is a major New Zealand Kabocha grower and grows the following popular varieties. We also supply Tongan squash from August to December. Method of Shipment: Reefer containers. Dukkah is a mixture of sesame, coriander and cumin seeds, hazelnuts, salt and black pepper, all coarsely ground. Preheat the oven to 180°C (350°). Cut the squash in 2.5 cm cubes. Spray with a little oil then toss with the salt, pepper and dukkah. Pour the extra virgin olive oil into a large roasting pan and add the squash. Roast for about 25 minutes or until cooked. Meanwhile, cook the penne in a large saucepan, until just tender. Drain well. Add the pumpkin, adding more olive oil if necessary. Warm through on medium heat. Add the ricotta, tomato and basil. Toss carefully. Lightly pile into bowls to serve. Can be sprinkled with extra dukkah if desired. Serves 4. Sauté the bacon in a large saucepan, until crisp. Remove with a slotted spoon. Sauté the onion in the bacon fat until limp, about 5 minutes. Add the squash, oregano, thyme and stock and bring to the boil. Cover and simmer until the squash is tender, about 10 minutes. Stir in the creamed corn, whole kernel corn and milk and heat through. Add the red pepper and the bacon to the chowder and gently heat. Serves 6. Recipe© supplied by food consultant Jan Bilton. Serve as an accompaniment to a main course. The vegetable slices should be about 7 cm long. To prepare the batter, beat the egg yolk together with the water. Sift in the flour and cornflour and whisk well. Stand for 10 minutes before using. Dip two vegetable slices in the batter and deep-fry quickly, until the batter is crisp. Drain on paper towels. Repeat with the remaining squash. Serve with lemon wedges. Excellent scattered with dukkah. Serves 4. For best results, bake the squash in the oven. Lightly grease a 23-25 cm fluted flan dish with some of the melted butter. In a large bowl combine the flour, rolled oats and sugar. Stir in the remaining melted butter. Press into the flan and bake for about 20 minutes, until lightly browned. Lightly beat the eggs and combine with the well-mashed squash, milk, flavourings and sugar. Stir until smooth. Pour into the flan and continue baking for 30 minutes or until set. Meanwhile, prepare the topping. Combine the sour cream, sugar and vanilla, until smooth. Spoon evenly over the flan and return to the oven for 10 minutes. Sprinkle with walnuts. Cool to room temperature and serve. Serves 8-10. 1 1/2 cup chopped walnuts. Brush a loose-based 23cm (9in) cake pan with a little of the melted butter. Combine the remainder with the biscuit crumbs and press onto the base of the pan. Chill. Peel and seed the squash. Steam, until tender. Drain well, mash and cool. There will be about 2 cups of mashed squash. Pre-heat the oven to 160°C (325°F). Beat the cream cheese and honey, until smooth. Add the eggs one at a time, beating, until blended. Add the cream, squash, vanilla and spices and mix well. Pour into the pan. Bake for 50-60 minutes, until the cheesecake sets. 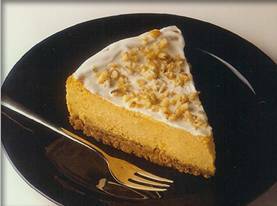 Combine the sour cream, honey and vanilla and spread over the cheesecake. Bake a further 10 minutes. Cool. Top with nuts. Remove from the pan and chill. Serve with coffee or as a dessert. Serves 8-10. Sauté the curry paste in the oils for 1 minute in a heavy pan. Add the pork in batches and sauté until browned evenly. Remove the meat and add the onions, carrots, leeks, lemon rind and garlic and sauté, until browned. Return the meat to the pan. And add the coconut cream and chicken stock. Bring to the boil. Cover and simmer over very low heat for 1 hour. Add the squash and continue cooking for 30 minutes. Serves 8. Thai custard cooked in a squash. Prepare the squash by washing and drying the outer skin. With the point of a small sharp knife, cut out the stem, leaving a small opening. Retain stem as a lid. Spoon out fibre and seeds and any excess squash if very thick. Place the squash upside down on a paper towel in microwave and cook 8-10 minutes on high (100%) power or steam on a rack in a saucepan, until just tender. To prepare the custard, place eggs in a saucepan with the sugar and whisk, until light. Add the coconut milk and stir well. Cook over low heat, until slightly thickened. Pour the warm custard into the partly cooked squash and top with the stem lid. Stand upright in a steamer, cover and cook over boiling water until custard is set and squash tender. Test with a skewer through the squash skin. Remove the steamer from heat and allow squash to cool. Place on a platter and chill overnight. Slice in wedges to serve. Serves 10 as a dessert. Heat the olive oil in a saucepan and sauté the onion on medium heat, until softened. Stir in the curry powder and heat to develop the flavour for about 30 seconds. Add the chopped squash, water or stock and orange juice. Cover and simmer for about 25 minutes, until the squash is cooked. Meanwhile, cook the pasta in a large saucepan of boiling water, until just tender. Purée the squash and thin if necessary with extra stock or orange juice. 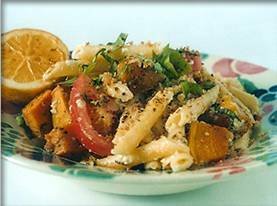 Reheat and serve over the drained, cooked pasta. Serves 4. Melt the butter in a heavy saucepan and sauté the onion, until tender. Add the squash, chilli, stock, thyme, salt and pepper. Cover and simmer until the squash is tender. Purée until smooth. Before serving, stir in the 1/2 cup of cream. To make the topping, lightly whip the cream with the seasonings. Ladle the soup into bowls and top with a little of the whipped cream and some chopped chives. Serves 6. Cook the pasta in plenty of boiling, salted water until just tender. Drain and place to one side. Heat the oil in a heavy saucepan. Add the spices, shallots and garlic and stir-fry on low heat until fragrant, about 3 minutes. Add the water, cream and squash to the pan. Cover and simmer until tender, about 20 minutes. Add the tomatoes and pasta and heat through. Serves 4-6.